Photograph of a Bhisti filling his Pukhal at Surat in Gujarat, taken by Shivashanker Narayen in c. 1870, from the Archaeological Survey of India Collections. 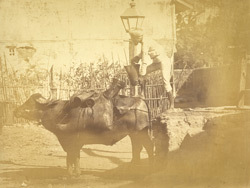 This image shows a water carrier pouring water from a leather bucket into the leather container slung over the back of a bullock. A description in Volume IV of 'The People of India' by John Forbes Watson states, "A Bheestie or Pukkalli [using a bulllock - as in this image] is a domestic servant in every Mahomedan household in India which can afford to keep one. In wealthy families several may be kept, and in English families, regimental messes, and the like, the same custom prevails. Where a special servant cannot be afforded, Bheesties deliver as many potsful or skinsful as may be needed during the day, and are paid in proportion. They also serve in the regular army, both in the infantry and the cavalry &c. In the infantry one or two are attached to every company, European and Native, as it has also its barber and washerman. They accompany the regiment on its march, filling their bags from running streams or cool wells as fast as they are emptied by the thirsty soldiers. They also go into action their corps, supplying water under the hottest fire...In cavalry regiments a Pukkal Bheestie...is also on the establishment of every troop, in the proportion of one to twenty-five or thirty horses...The Pukkalli is very fond of his bullock, and takes great care of it." Watson and Kaye's 'The People of India', published in eight volumes from 1868 to1875, was the first official attempt to create a comprehensive record of Indian types.